Don’t you wish nature paid attention to you schedule? That every plan worked the way it should? For those travellers who like spending time outdoors, especially in pursuit of seeing Mother Nature’s creatures, you know that patience is the key. For my group visiting the Caroni Swamp, the highlight of the tour was to see the red ibis, the national bird of Trinidad & Tobago, which is easily spotted here. But, we had to wait until dusk, when the ibis would come in and settle in for the night on a grove of trees in the middle of the swamp. So we sat on our boat, waiting. Looking to the sky for the bright red bird to show up and let us know of its presence. And who likes waiting? I’m a pretty patient person, but after 15 minutes, with everyone else shifting regularly out of boredom, the anxiety of waiting took its toll. I was bored. There wasn’t much else to look at other than the far shores of the swamp’s lake, and the silence occasionally broken by a bird’s call to another. But we waited. And then we saw a few birds. And they were very bright red and settled in on the grove of trees. Was that it? Was that what we were waiting for for almost a half hour? We stayed another 15 minutes, trying to keep engaged and out of boredom started snacking and making jokes. 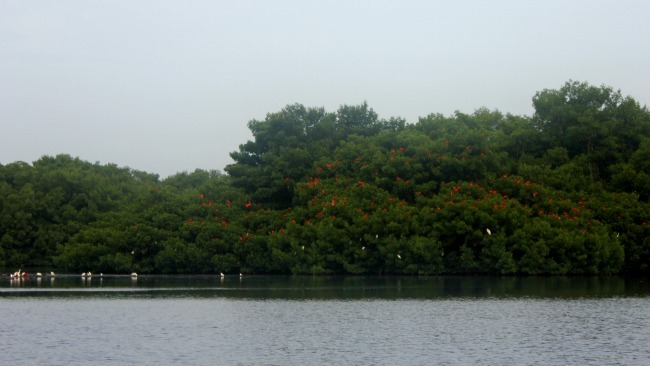 But then we saw a huge group of red ibis and more and more. The tree became covered in the bright red birds, with an occasional white bird in between, seemingly just to add contrast. And as the sun started to set, and we slowly left our perch to return to the boat launch, the birds kept coming. I wondered if they were all sharing stories of their day, what they had seen. And if they were wondering why another boat had stayed for such a short time and then left. The birds were beautiful but the quick taste was all I needed.